Antonello Favro was an Italian soldier who arrived in Fontecha (Basque Country in Northern Spain) in 1936 to fight during the Spanish Civil War. Antonello taught our grandfather, Tomás Ortíz de Zárate how to produce vodka. He was the first Basque Moonshiner. They used an original recipe brought from Piedmont’s meadows and took advantage of local potatoes, plentiful and good-quality, to hand-craft the first spirits. This old recipe has been preserved to the present day. Basque Moonshiners has been crafting its own spirits with the old still for more than 70 years. Our Pot-Still has seen many moons and from that old recipe, Basque Moonshiners distillery was born with its first creation BASMOON Vodka. Source: Wikimedia, The Library, Blue Waters Mountain Lodge. 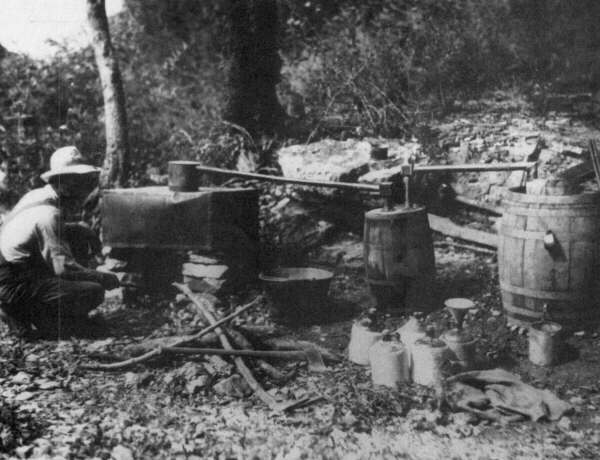 American Moonshiners are our inspiration, brave people who dared the “Prohibition” during Dry Laws. They used old pots and copper stills to distil their own moonshine hidden in forests during the night to avoid discovery. Because enjoying good things requires you to take risks. Inspired by those Moonshiners and following the Basque tradition hand-crafting spirits like Patxarán, Basque Moonshiners decided to make their own way. Basmoon vodka is the end result of a recipe improved with time. Handmade in Vitoria at Basque Moonshiners Distillery, Basmoon is a premium quality potato vodka five times distilled. With moonshiner passion, taking risks and admiring hand-crafted beauty. Para visitar esta web tienes que ser mayor de edad.¿Tienes más de 18 años? Entrando en esta página aceptas la política de privacidad y cookies.